Since the beginning, Valerie has worked full time with our property management staff to offer our owners personal service, attentiveness, and optimum revenue generation. This owner-employee partnership enables us to offer you affordable management fees and higher net income. We have lived and worked on Perdido Key since 1982 and purchased Perdido Realty in 1994. Allan, a visionary, purchased the domain, www.perdidokey.com, and developed the first Perdido Realty website in 1995. Our office and all rental units are located in Perdido Key, FL so that we can closely monitor every aspect of rental management. 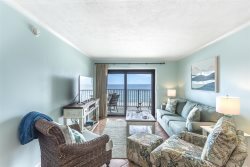 Perdido Realty does not charge an initial administrative fee, linen set up or linen shrinkage fees, surcharges for credit card usage, daily amenity package charges or cleaning charges to owners. Guests pay cleaning fees and all sales taxes. It is important for you to consider this when you calculate projected net rental income. Perdido Realty prides itself on knowing our owners by name and listening to your needs and preferences. We promise to treat your property as our own and accomplish that through organization and attention to detail. We work diligently to provide excellent housekeeping and maintenance services. We employ our own full-time cleaning staff and do not use contract cleaning services. The result--we started with 3 condominium units in our program and have 150 units today solely from owner, realtor and personal referrals. We apply the same philosophy to our rental guests by offering competitive rates, old-fashioned customer service, and clean, well-maintained condominium units. Guest testimonials repeatedly compliment us on our stellar service and validate that with repeat visits. Repeat customers account for 80% of bookings. We have a great team of truly caring professionals. Michele Stearns, our Resort Services Coordinator, has been with Perdido Realty for 9 years. She cares both for owners and guests as though they were her own family. Her endless energy and positive approach are invaluable assets to our firm. Mark Malone celebrates his 6th anniversary with us this year. He assists Michele as Senior Field Maintenance and Housekeeping Supervisor. Ada Benitez has been with Perdido Realty for 12 years and has worked her way up the ranks to Housekeeping Inspector. Jean Wojnarowski, bookkeeper, has managed all accounting functions for 21 years. We are www.perdidokey.com and maintain high site ranking on Google through search engine optimization. Our new dynamic website, which is mobile and tablet friendly, and new rental software program goes live in May 2016. We gain further exposure through the Beach Guide and Data Sphere Technologies web advertising and will soon have all properties linked to AirBnb at no cost to our owners. While we aggressively market your property, Perdido Realty works hard to make sure that guests abide by all rental rules and Association regulations relating to age and number of occupants per unit, parking restrictions, common area use. We require a signed document stating our rental policies prior to check in. All guests are given a copy of your Association rules at check-in and we work closely with Association Managers to when issues concerning your unit arise. We love what we do and welcome you to contact us.